Rooms at Hotel Escorial are all comfortable and elegant, to cheer the guests' stay. Comfort : rooms entirely renovated with balcony, safe, direct dial telephone, TVLed/Sat, air conditioning, heating, mini-bar, private bathroom with shower and hair dryer. IV floor : rooms with balcony with sea view , safe, direct dial telephone, TV Led / Sat, air conditioning, heating, mini-bar, private bathroom with shower and hairdryer, bathrobe. 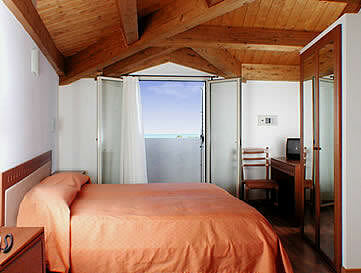 For discerning guests Hotel Escorial offers comfortable rooms with sea view and king-size beds. For children, too, there are comfortable cots and safety rails.